According to the Ohio Department of Wildlife, turkeys once lived in forested areas across the entirety of Ohio and provided food for Native Americans and settlers. The population dropped to no birds in the state by 1904 as forests were turned into cropland. They stand between three and four feet tall and can weigh up to 24 pounds. OHIO VALLEY —For many hunters, spring brings the unmistakable sound of gobbling wild turkeys as Ohio’s annual hunt of this popular game bird begins, according to the Ohio Department of Natural Resources (ODNR). The state is divided into two zones for the 2019 spring turkey hunting season: a south zone, which opens to hunters on Monday, April 22, and a northeast zone, which opens to hunters on Monday, April 29. The youth wild turkey season will occur on Saturday and Sunday, April 13-14. Hunters can view the 2019 spring turkey season zone map at wildohio.gov. The ODNR Division of Wildlife anticipates approximately 50,000 licensed hunters will enjoy Ohio’s popular spring wild turkey season before it ends on Sunday, May 19, in the south zone, and Sunday, May 26, in the northeast zone. 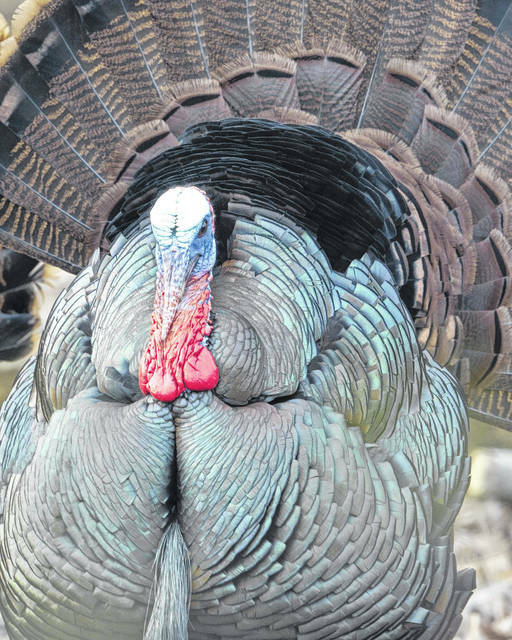 The spring and youth turkey seasons are open statewide, except for Lake La Su An Wildlife Area in Williams County, which requires a special hunting permit. All hunters are required to have a hunting license, in addition to a spring turkey hunting permit. The youth-only turkey season is April 13-14 for youth possessing a valid youth hunting license and a turkey permit. Youth hunters must be accompanied by a non-hunting adult, 18 years of age or older. Only two wild turkeys may be checked by a youth hunter during the two-day season. Additionally, if two turkeys are harvested in the youth season, no additional birds may be taken by the youth hunter for the rest of the spring turkey season. Hunting hours from April 22-28 in the south zone and April 29-May 5 in the northeast zone are 30 minutes before sunrise until noon. Hunting hours from April 29-May 19 in the south zone and May 6-26 in the northeast zone are 30 minutes before sunrise to sunset. Hunting hours during the two-day youth season are 30 minutes before sunrise to sunset. The spring season bag limit is two bearded wild turkeys. Hunters can harvest one bearded turkey per day, and a second spring turkey permit can be purchased at any time throughout the spring turkey season. Turkeys must be checked no later than 11:30 p.m. the day of harvest. All hunters must report their turkey harvest using the automated game-check system, which is available online, by phone or at a license agent. A complete list of participating license agents can be found at wildohio.gov. Visit the Turkey Hunting Resources page at wildohio.gov, or call 800-WILDLIFE (945-3543) for more information about the game-check process. Hunters may use shotguns or archery equipment to hunt wild turkeys. It is unlawful to hunt turkeys using bait, live decoys or electronic calling devices, or to shoot a wild turkey while it is in a tree. The division advises turkey hunters to wear hunter orange clothing when entering, leaving or moving through hunting areas in order to remain visible to others. Wild turkeys were extirpated in Ohio by 1904 and were reintroduced in the 1950s by the Division of Wildlife. Ohio’s first modern-day wild turkey season opened in 1966 in nine counties, and hunters checked 12 birds. The wild turkey harvest topped 1,000 for the first time in 1984. Spring turkey hunting opened statewide in 2000, and Ohio hunters checked more than 20,000 wild turkeys for the first time that year. Last year hunters checked a total of 22,571 wild turkeys during the 2018 spring turkey season. The mission of the ODNR Division of Wildlife is to conserve and improve fish and wildlife resources and their habitats for sustainable use and appreciation by all. Visit wildohio.gov to find out more. ODNR ensures a balance between wise use and protection of natural resources for the benefit of all. Visit the ODNR website at ohiodnr.gov.